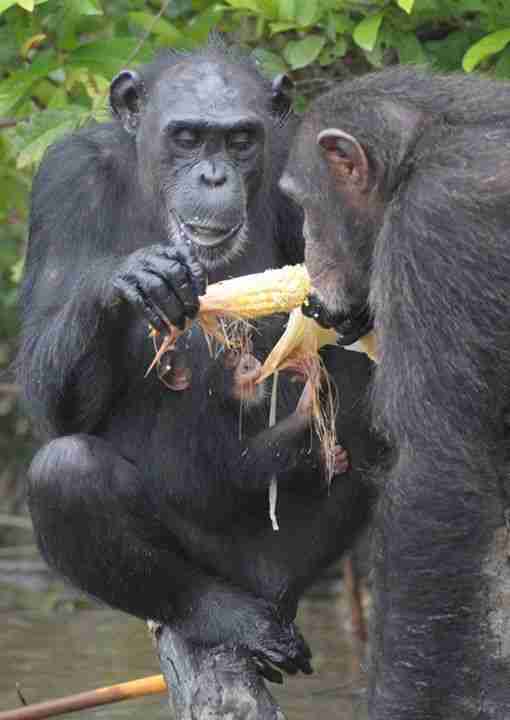 These chimps have lost everything thanks to humans - but they still have each other. 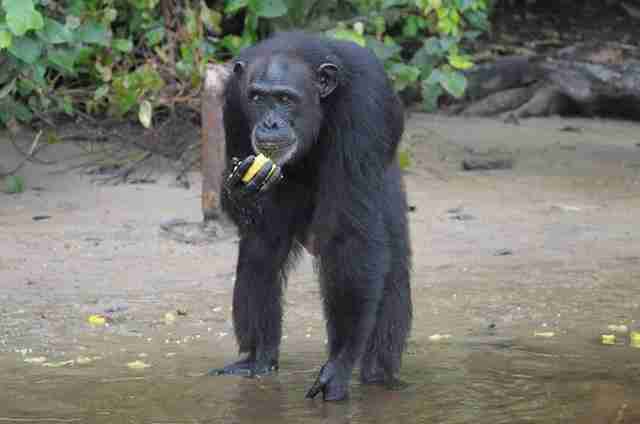 Etti the chimp lives on a small island in Liberia. For decades, she and her companions were used in painful medical tests by the New York Blood Center (NYBC), then abandoned on the string of islands when their usefulness to the labs ran out. For several years, NYBC would drop off food to the islands - which have no natural food source - every other day. This spring, NYBC announced it was leaving them to starve. 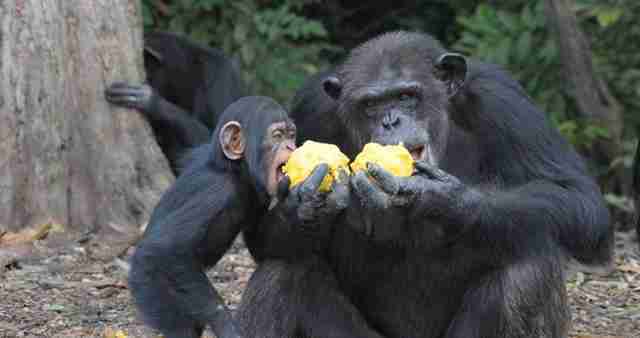 Now, every meal is uncertain, as the chimps must rely on the kindness of human volunteers who drop off meals. 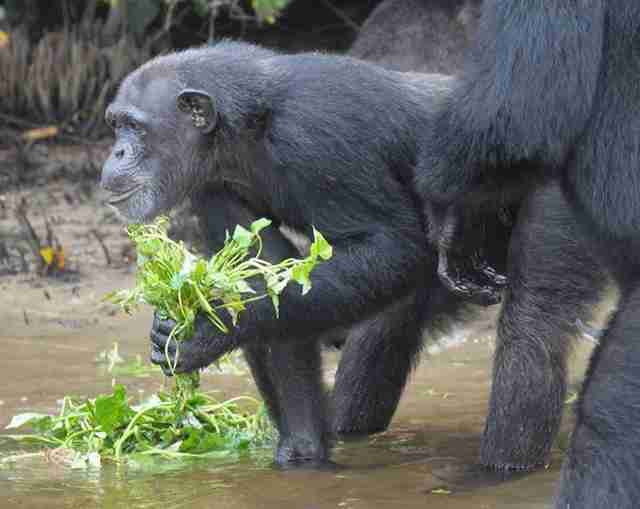 But still, Etti shares what food she has with her 2-year-old daughter and the other young chimps on the island. "She is a very sweet mom to all the babies," volunteers wrote on a Facebook page managed by the Humane Society of the United States (HSUS). "Although she covets her rice balls, she is often seen sharing them with her daughter and the other babies on the island." Etti, who's now 29, first began living at the lab since when she was just 1 year old. During her many years there, NYBC subjected her to 61 painful liver biopsies and anesthetized her hundreds of times before she wound up in Liberia. She had several babies - all of whom died except her most recent daughter. 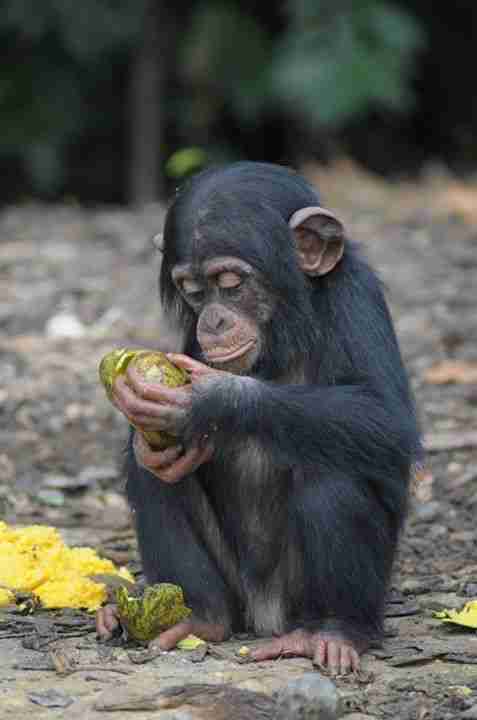 Today, there are more than 60 chimps just like Etti living on the tiny islands. Many were taken from the wild - others were exotic pets whose owners tired of them and dumped them at the lab. 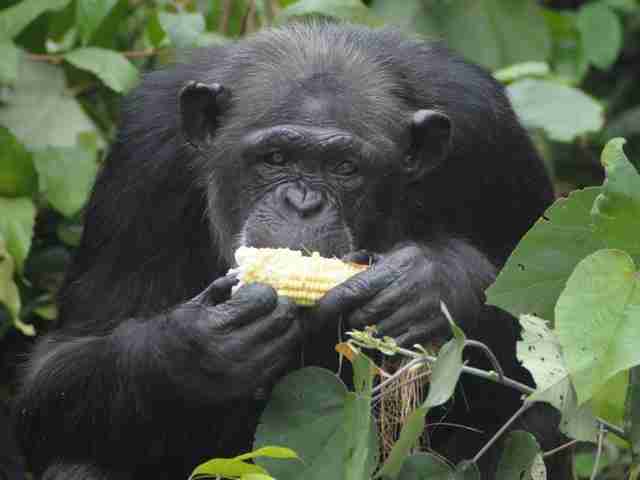 And every single chimp has a backstory just as sad as Etti's. Spring Roll, who's now 39 years old, spent decades being tested on by NYBC. During her years in the lab, they anesthetized her nearly 300 times and performed 45 painful liver biopsies. She lost her eye when researchers accidentally shot her with a tranquilizer dart. 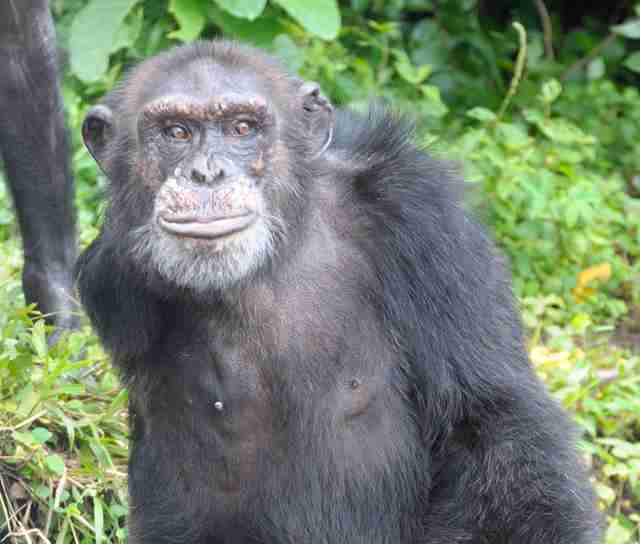 Samantha is 41 years old and is the oldest chimp on the islands. She spent most of her life at NYBC and lived for several years chained by her neck to a jungle gym. "Her caretakers say she is a very clever chimp and fondly remember how she acted as a surrogate mother to many young chimps in her group when she was first released to the islands many years ago," the support team wrote. Juno was first brought to the lab for testing in 1985. She was just 4 months old. When Bullet was just a baby, his mother was shot and killed. He was also shot, and lost his right arm from the injury before being sent to NYBC, where he spent decades being experimented on. When NYBC cut off all funding to the isolated islands this spring, willingly leaving the chimps to starve, the research group said it "never had any obligation" to care for the animals after stranding them. The announcement was greeted with visceral outrage by members of the scientific and animal welfare communities alike. Famed primatologist Jane Goodall penned an open letter condemning NYBC's decision, which she called "completely shocking and unacceptable." Duke University primatologist Brian Hare told the New York Times, "Never, ever have I seen anything even remotely as disgusting as this." Of course, the wellbeing of the chimps was their primary concern. Members of HSUS rushed to the island to check on them. 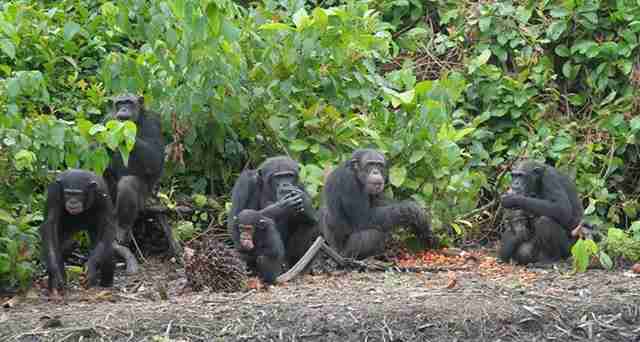 Of the 200 chimps NYBC originally stranded on the islands, only 66 were still alive. 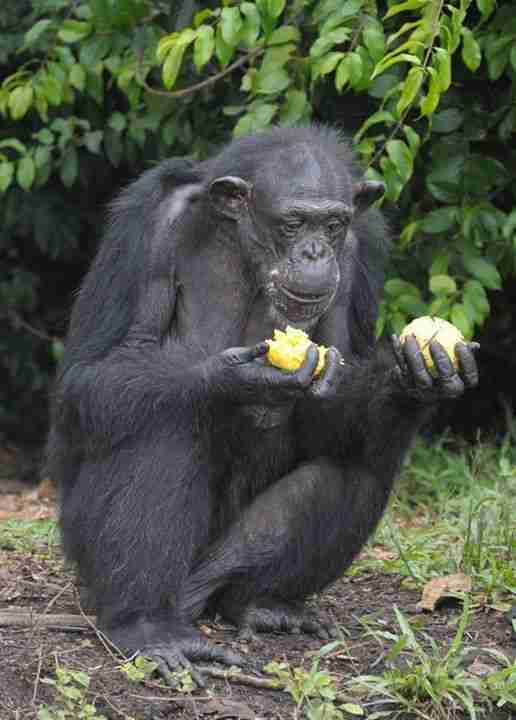 Many chimps had health problems from the years of experiments. Some were blind - others were limping. And even worse - NYBC had left the abandoned chimps with no source of fresh water. It seemed NYBC was content to let the animals, which the center had tortured for years, die of hunger and thirst. Since then, there have been ongoing protests against NYBC's callous treatment of the animals, who gave them so much. While the center has refused to acknowledge its wrongdoing, people are determined to make NYBC accountable and once again provide support for the helpless chimps who were tortured and then abandoned. But in the meantime, supporters have taken up the burden of caring for the chimps. Led by HSUS and other welfare groups, devoted local volunteers and members of the public have come together to sustain the little colony of abandoned chimps for the past eight months. Snow White is a 35-year-old female who spent most of her life being tested on at NYBC. Here, she shares some corn with her year-old baby and another female named FDA.Jenny Desmond/Humane Society of the United StatesWithout public support, they would have perished within weeks.Now, dedicated volunteers arrive each day with a boatload of fresh fruit and other food to make sure the chimps have enough to survive, paid for largely by public donations.The chimps wait by the coast for their next meal.Jenny Desmond/Humane Society of the United StatesAnd, unlike NYBC, these chimps' new carers aren't giving up - and they're dedicated to making sure the rescued animals have everything they need to thrive, whether that's by pressuring NYBC to step up or providing for the chimps themselves. "These chimpanzees have been through so much already - from the research they endured to civil wars in Liberia that resulted in the death of many of the original 200 chimpanzees," supporters wrote on a fundraising page. "Ultimately, with your help, we will work together to find a long-term solution to ensure the humane, lifetime care of these chimpanzees. "Etti's 2-year-old daughter examines food dropped off by volunteers.Jenny Desmond/Humane Society of the United StatesIf you'd like to join other members of the public in buying food and water for these chimps, you can make a donation here. 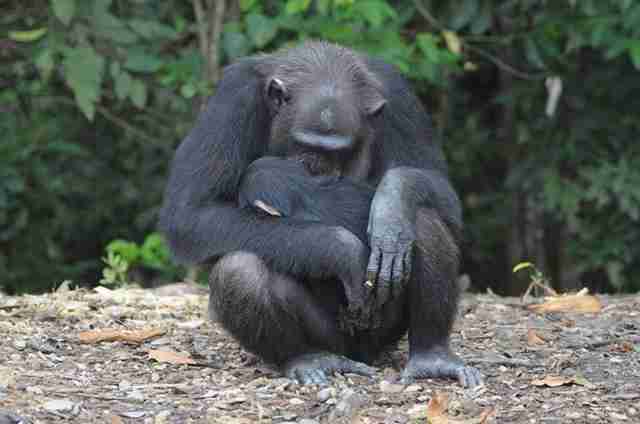 You can also sign this petition asking NYBC to take responsibility for the chimps it abandoned. Without public support, they would have perished within weeks. 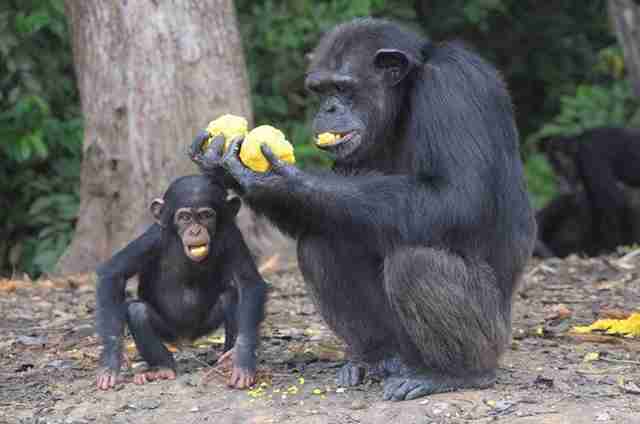 Now, dedicated volunteers arrive each day with a boatload of fresh fruit and other food to make sure the chimps have enough to survive, paid for largely by public donations. And, unlike NYBC, these chimps' new carers aren't giving up - and they're dedicated to making sure the rescued animals have everything they need to thrive, whether that's by pressuring NYBC to step up or providing for the chimps themselves. "These chimpanzees have been through so much already - from the research they endured to civil wars in Liberia that resulted in the death of many of the original 200 chimpanzees," supporters wrote on a fundraising page. "Ultimately, with your help, we will work together to find a long-term solution to ensure the humane, lifetime care of these chimpanzees."